We headed back to Buffalo, NY. We were just here a couple weeks ago but it seems like a long time ago. We started out sightseeing here so it seems fitting we should finish it here. After today we just drive and drive and drive. The Franks Lloyd Wright houses we wanted to see weren’t open on Tuesdays, when we were here at the start, so this worked out just fine. 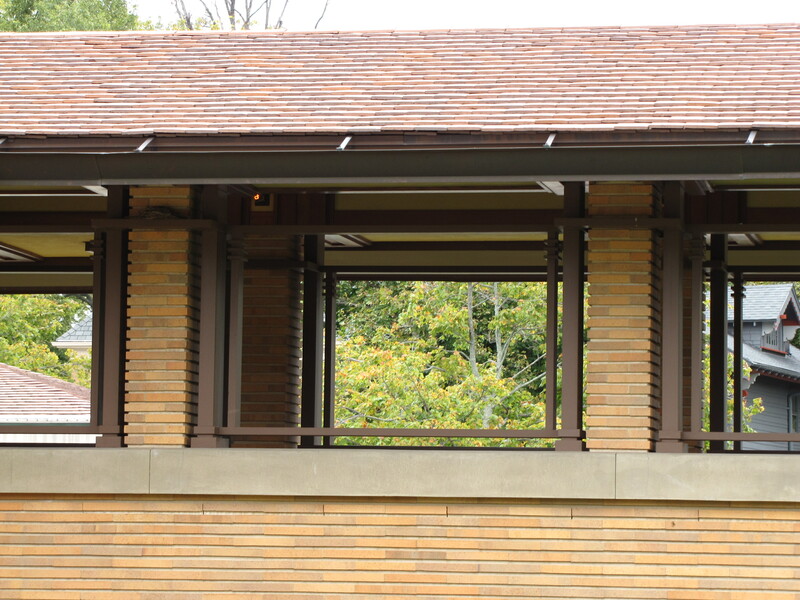 Our first stop was Frank Lloyd’s Wrights Darwin D. Martin House Complex. This was constructed between 1903 and 1905. 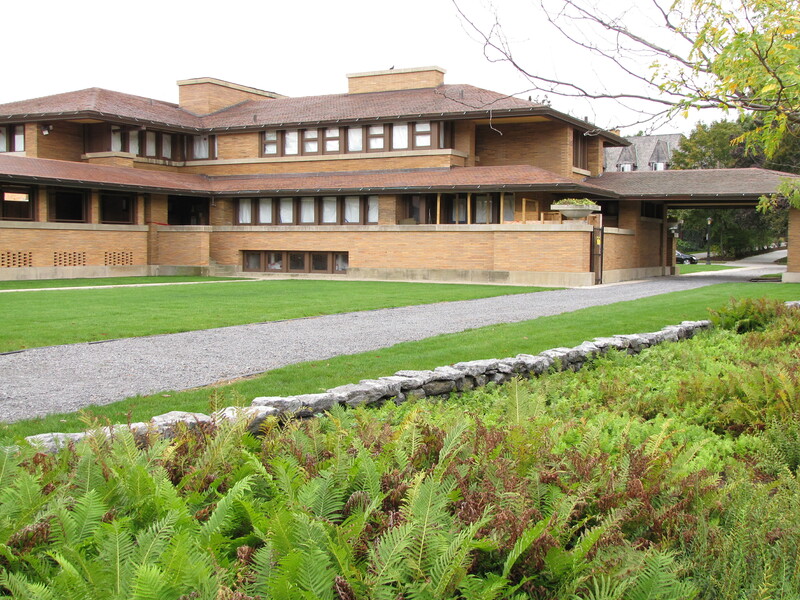 It is his Prairie styling and ranks as one of his finest residential works and I think largest. It is some 10,000 square feet and was built for Mr. Martin who was a wealthy industrialist and who, over the years loaned Wright a considerable amount of money. Martin worked for the Larkin Soap Company and when the company was going to build a new headquarters Martin suggested Wright. Larkin met this new young architect when he went to visit his brother in Oak Park, Illinois. The Larkin Company Administration Building no longer stands but was considered to be one of Wright’s greatest achievements. Mr. Martin started out at an early age selling soap door to door and eventually became one of the highest-paid business executives in the country. At this point he thought he needed a house fitting his status and had Wright build it. 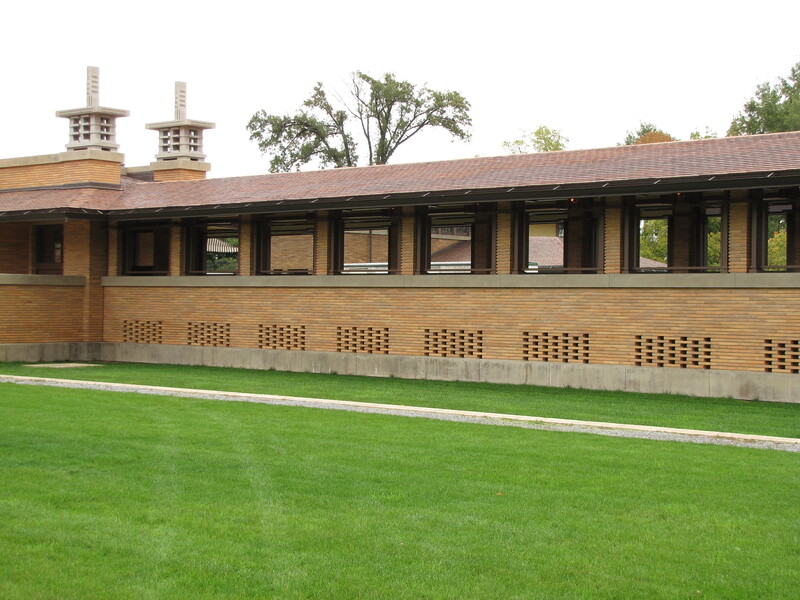 As seemed to be the case in all Wright houses this one, when finished, was way over budget. 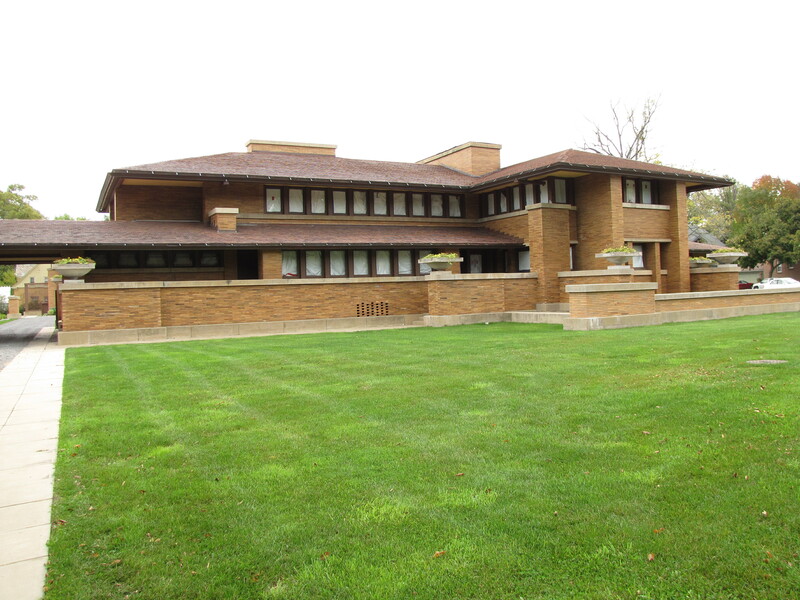 The house is on about 1 ½ acres and is very recognizable as a Wright house, being his “Prairie-style.” It has graceful sweeping lines and the interior is supposed to be very spacious. Some critics have said it is one of Wright’s greatest works. Right now you cannot tour the inside of the house as they as doing a lot of restoration and there is asbestos danger in there. They plan on having the restoration finished in about a year. However, the tour guide gave a good explanation of the exterior design, how it sat on the lot, placement of the front door, which is not visible from the street, and windows, etc. One thing Mrs. Martin requested was that they have someplace for plants. To save money the Martin’s told Wright they saw a good atrium in the Montgomery Ward catalog and he could add it to the back of the house. Of course Wright wouldn’t stand for that and told them he would build something. The result was a covered pergola, leading from the main house to the gardens with a conservatory at the end. 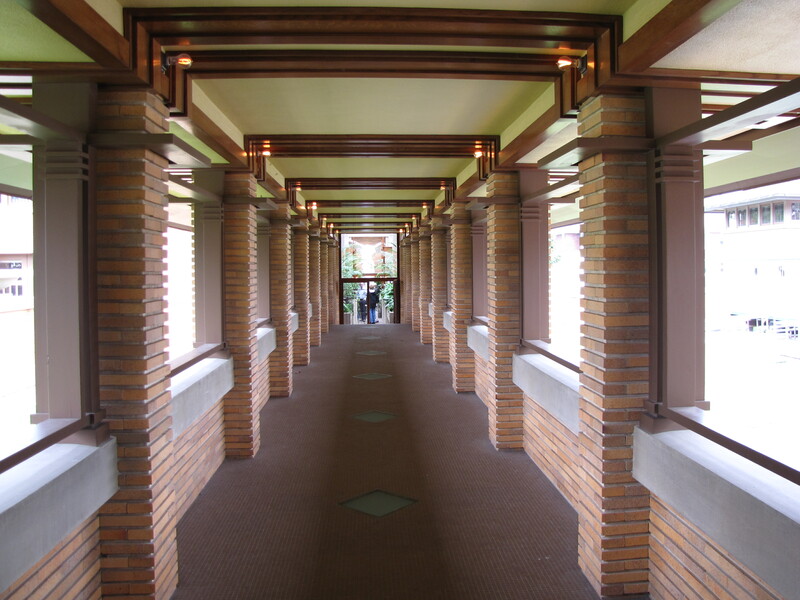 I liked this walkway and conservatory a lot. This we were able to go into. If you know anything about Wright you know he always has pretty low ceilings. But he relented in here and has a high glass cathedral looking roof. That was because palms were very popular then and they grew pretty tall. At the end of the walkway was an over-size statue of the winged victory. Down the walkway of the pergola the openings were framed to look like windowsand match the rest of the house. The interesting thing was that in the stock market crash Mr. Martin lost a lot of his fortune. Sometime after he died Mrs. Martin tried to sell the house because she could no longer keep it up. The person who purchased it tore off the pergola and built apartment buildings on the property. Eventually the organization to preserve the complex bought those buildings, tore down the apartments and rebuilt the pergola and conservatory. Where the complex comes in is that Martin enticed his sister to move to Buffalo by having Wright build her a house right behind his. There was a long story about how the Martin family was separated and he was always trying to bring them all back together again. We were able to tour his sister’s house. Not a lot of furniture in it and a few of the pieces that were there were from the Dana house in IL. 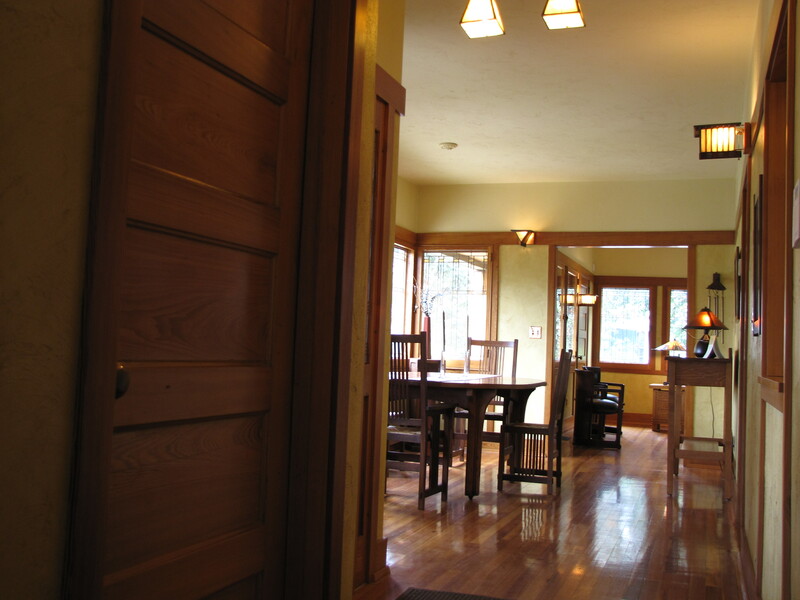 In the dining room was a built in bookcase and china cabinets. That is because Wright didn’t want any furniture that was not to his liking there and this is the way he assured they wouldn’t be using some other piece. They are also in the process of doing restoration on this house. On the grounds is also a carriage house that served as the chauffeur’s residence. It has the arts and crafts interior and is well preserved. 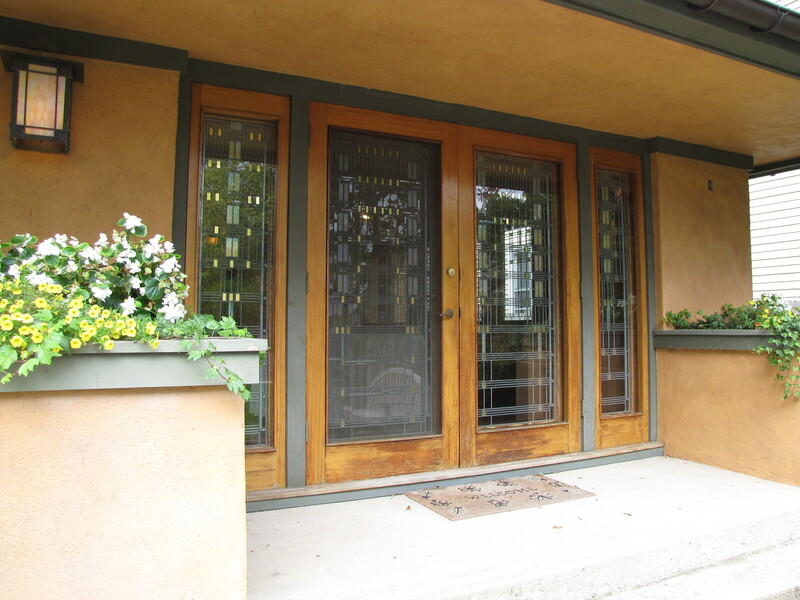 The interior has a very warm feeling and is lit by an abundance of leaded glass windows. It was interesting hearing of the problems involved in restoring a house. One being that they are putting in air conditioning and they have to disguise the registers. Another big problem is replacing wood in places. The type of wood that would have been available is no longer available Like the molding in the dining room was from a very old stand of trees and there is none left in the US. They are having to look elsewhere for replacement wood. After they finish restoring the house they are going to restore the landscaping and gardens back to the way they were. Another dispute the Martin’s had with Wright was they wanted to get a greenhouse out of a catalog. Once again Wright said he could build one but they did put their foot down and get a catalog greenhouse. It is tucked away on the back of the property. When the Martin’s didn’t want to do something because of cost it seems like Frank had the silver tongue and talked them into it. 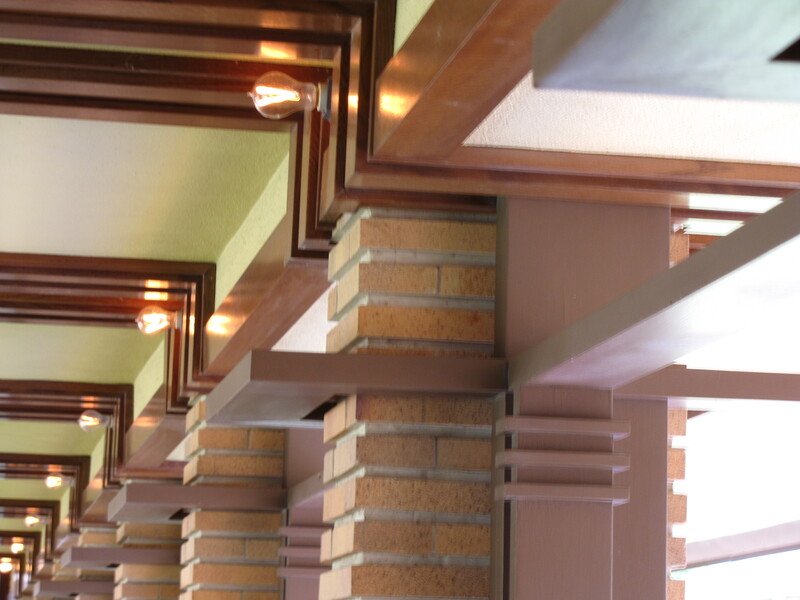 Like the concrete design ornamentation he has over the conservatory. 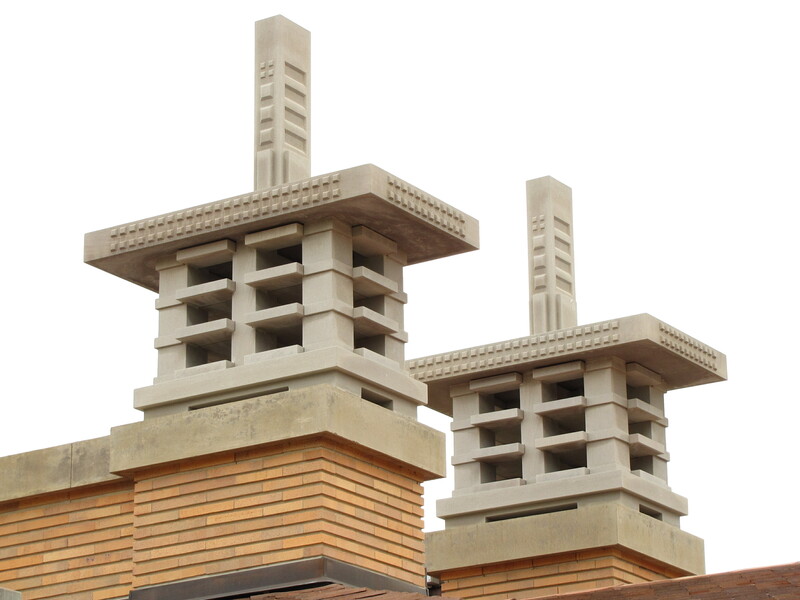 Wright told him they would attract purple martins and keep mosquitoes away. Our guide said he has never seen any kind of bird use them However, if you see Wright’s drawing he penciled in birds going in and out. It was an insightful tour and I certainly will want to come back again some day when all the restoration is complete. Another interesting way Wright would convince the Martins of something is that he was always talking about the importance of family and how this would help with family unity. Interesting coming from Wright who left his first wife and their children. If you read Loving Frank or Frank’s Women you will know what I am talking about.